↑ "[...] Jana Gana Mana is the National Anthem of India, subject to such alterations in the words as the Government may authorise as occasion arises; and the song Vande Mataram, which has played a historic part in the struggle for Indian freedom, shall be honoured equally with Jana Gana Mana and shall have equal status with it." Template:Harv. ↑ "The country's exact size is subject to debate because some borders are disputed. 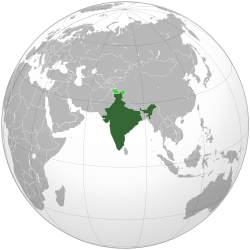 The Indian government lists the total area as 3,287,260 km2 (1,269,220 sq mi) and the total land area as 3,060,500 km2 (1,181,700 sq mi); the United Nations lists the total area as 3,287,263 km2 (1,269,219 sq mi) and total land area as 2,973,190 km2 (1,147,960 sq mi)." Template:Harv.